Okay okay, I decided to no longer ignore the small amount of international visitors of my page. I’m going to write my posts in english from now on, so please feel free to correct me at any time. At the moment I’m doing some character designs for a children’s project. 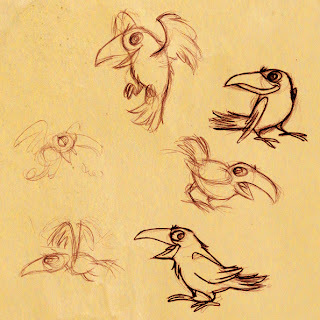 This would be one of the characters: Hugin The Raven. (strange name, I know). By the way, my 20 page Christmas comic book story is finally finished and as soon as the children project’s over I’m going to start with a new 12- paged story.